I’ve started knitting this soft little blanket for my coworker, whose baby boy is due at the beginning of August. It satisfies all my current urges: comfort knitting, soft yarn, yet a little different. I am having a blast. 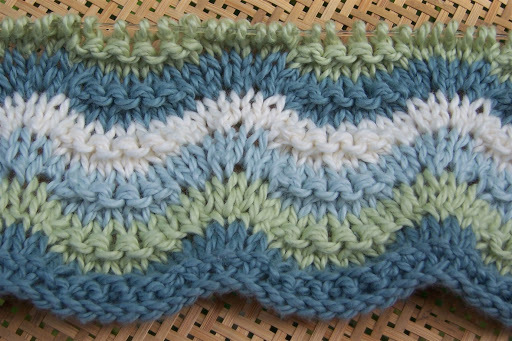 The pattern is “Blue Lagoon” from Jan Eaton’s 200 Ripple Stitch Patterns. I wanted a stitch that would ripple without yarn-overs; this one uses M1’s instead, and purls for texture. I’ve chosen my own yarn and colors, though. The yarn is Debbie Bliss Pure Cotton in Spruce, Mint, Pale Green, and Ecru. I think this is a somewhat new yarn — it’s very soft, loosely plied, and knits easily considering it’s cotton. I chose it because the colors are so nice, and exactly what I was looking for. It’s machine washable, too. I’m using 5mm/US 8 needles, and the blanket will be about 25 inches wide. The knitting goes pretty quickly, too — I just started this morning. One of these days I’ll crochet a ripple — I love some of the patterns in the book, and I haven’t crocheted in a long time. My other current obsession is Ravelry. Somebody, help me. I received my invitation to join yesterday, and I think that something has happened to Time since then, because it keeps disappearing. Between the blanket and this amazing website, I think I’ve entered some sort of hole in the Universe. So far I’ve entered a few projects, and poked around everybody else’s stuff. I could spend a week just doing that, but then there’s the Library, the Stash, the … oh forget it. There are still relatively few participants (and they’re adding folks from the queue at a pretty fast rate, considering the time it must take to keep up with it) so it’s easy to spot people you “know” and check out their work. I’m going to try to go slowly, though. I really don’t have the time it takes to jump in with both feet, but I sure have had fun getting my feet wet! I didn’t spin today, which I’d planned to do; but I’ve had a wonderful, quiet day full of knitting and playing and resting up for the coming crazy week. It’s been just about perfect. How about you? Pretty blanket! I like ripple patterns, and am planning a feather and fan shawl – one of these days. love the baby blanket – and your spinning Peachy looks fabulous!Ravelry has been fun – I just wish I had more time to play with it. Lovely blanket pattern and colors. I’ve put name in for Ravelry and I haven’t been admitted yet. It’s just as well. Things here have been too busy with play with it. There will be time later. I’m still patiently … er, okay … not so patiently waiting for my Ravelry invite. I wanna play too! Soon, hopefully.Totally loving that baby blanket – lucky little boy to have such a beautiful blankie stitched with love. I like the colors on your ripple – it must be really soft, too!I host my own pictures, so I’m not on flickr, plus I already have all my projects/yarn/books/needles in databases on my PDA. I can’t see replicating the effort on Ravelry. It IS cool to look around and get inspiration! Oh that blanket is going to be stupendous!!! You really are loving that book aren’t you? I love the colors you chose for the blanket, it’s sure to be a favorite of mother and baby! I got an email from Casey on the 6th saying I was about 10 days out from an invitation! But from what I’ve been reading there’s a lot of work to get your stuff in. I know it was helpful and eye opening when I actually put my sock yarn on an Excel spreadsheet at the beginning of the year. What a shock when I photo each skein! But again, eye opening. I’m sure I’ll find stuff that I’ll never use. I wonder if they have a swap area. I find it frustrating that if you don’t have your invite, that you can’t get in to look. Sigh. Another week. And I still haven’t taken any of the photos I would need to get started. Geez, I’ve hardly made time to blog. Miss knitting with you guys, perhaps we can set up a “playdate” one day. I know, I’ve been hanging with the 6 year olds too often! That blanket is precious! I’ve had a similar Ravelry experience. I started to put all my projects on but then got a little distracted by looking at everything else! I’ve got the book you took the stitch pattern from. It’s great. I like your blanket a lot, but I’m blanket crazy anyway. What a pity I don’t have anybody who needs a baby blanket. I”m on the waiting list of Ravelry. Don’t exactly what’s it all about, but since everybody on it is so enthusiatic about it, I had to stand in line too. ;o)I had a very productive Sunday, spinning concerned. Hope your week will NOT be TOO crazy! Very pretty blanket! Ohhh. . . you just had to go mention Ravelry. I had meant to send in the request to join, but forgot to do so. Going over there right now! Ripple in still waterWhen there is no pebble tossed, Nor wind to blow . . .Now that’s stuck in my head. I love the colors, and also like to avoid YOs in baby blankets. They must eat baby toes, YOs, and that’s no fair. You and your amazing oceanic knitting! Wow!! I got my Ravelry invite last week, and realized that I will have to be in a really organized kind of mood (which is rare) to get around to taking pictures of all my stash and entering it in there. One could truly get sucked into that website and only surface for air a month later!